I love to make photos in art museums. I shoot there a lot for a project I’m working on. But this photo has been a pleasant surprise on several levels. Partly metaphorical. I was first drawn to the young woman with her high slit skirts, elegance and cell phone. 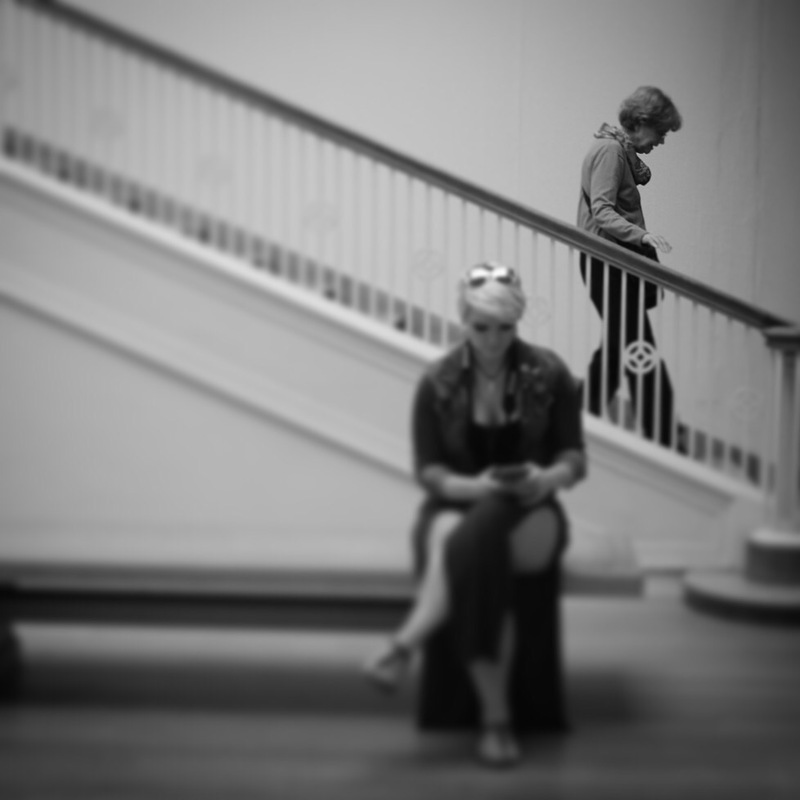 Here she was in the gorgeous space, completely absorbed in her device. Two ladies came down the stairs. Moving slowly. Clutching the rail. Step by step. They are thoughts in each other’s imaginations. Dreams of the past. Fears for the future. The older woman is the future of the young one. But she doesn’t see her, absorbed as she is in her phone. She’s in the unconscious. The shadow. But also for the older lady, the young one may be in part that youth and it’s conceits left behind. She recalls perhaps what it was like to be that young woman on the bench. Svelte in the body. And who knows what else? She’s my mother, my long deceased aunt of such grace, she my own future too. Is she wisdom or frightening vulnerability of age? It’s all just a narrative. My medial network I know. Spinning a story. But what an interesting and rich juxtaposition. I thank you for stopping by. For print purchases please contact me for details.